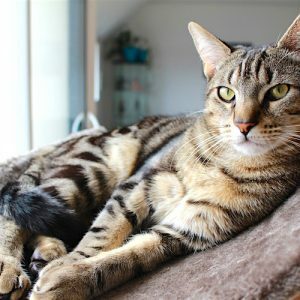 Give your cats their own wonderland in the safety and comfort of your home. 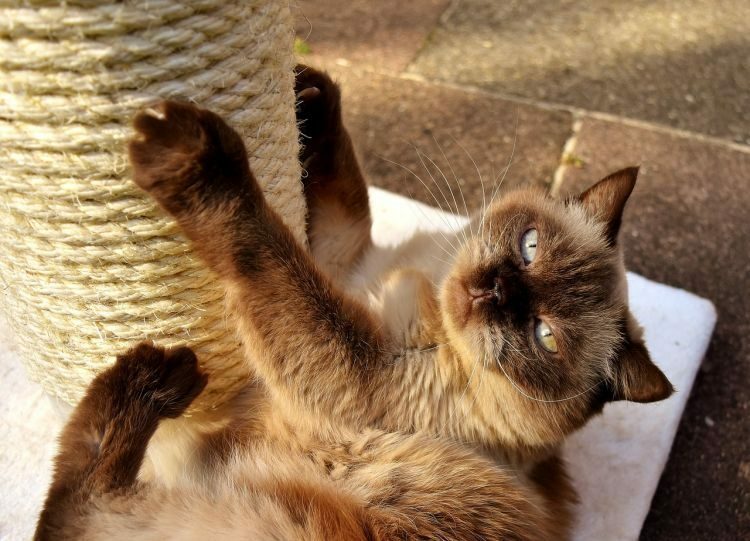 An indoor cat play area is fun for them — and good for their health. Years ago, my late husband built an outdoor enclosure for our cats out of scrap wood and chicken wire. The cats loved hanging out in there, playing tiger. But there were some downsides to this outdoor kitty paradise. There were a few escapes. Once in a while, one of the cats would accidentally get shut in the enclosure overnight. You couldn’t really get in there and clean this makeshift enclosure. And worst of all, 4 of our cats came down with a mysterious airborne virus, even though they’d been vaccinated. They all pulled through, but we came close to losing a pet. Nowadays, outdoor enclosures — or catios — are popular. My friend Barb built one for her cats that they love. But not everyone is comfortable with the catio option. I don’t have an outdoor cat enclosure at this house, and I have no intention of ever adding one. But I’ve learned that there are plenty of ways to create an amazing indoor cat play area. First, let’s talk about climbing the walls. CatsPlay notes that shelves allow your cat “to explore and lounge up high” — something that cats find deeply satisfying on a primal level. People can get pretty creative with these perches and walkways, as contractor Peter Cohen’s House of Nekko in Goleta, California, shows. 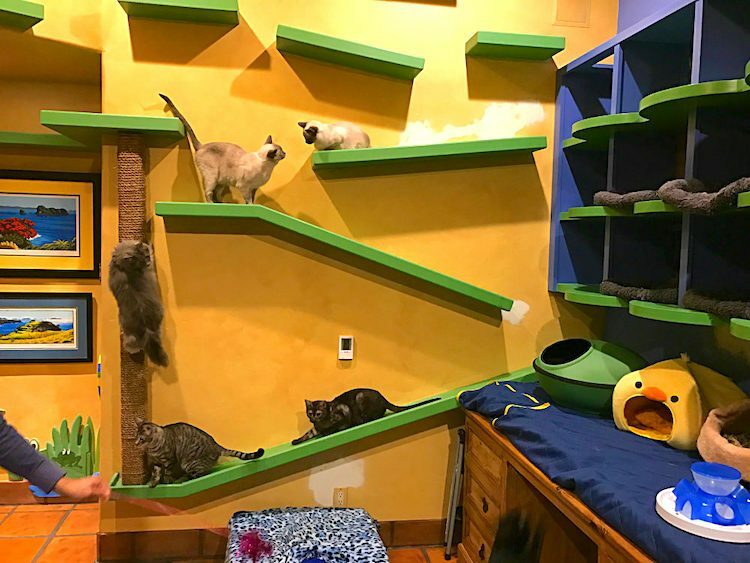 Over 20 years, Cohen — who is also the co-founder of ZenByCat, a nonprofit organization fighting the good fight against feline infectious peritonitis — built a colorful indoor cat play area in his home. In addition to the usual floating (wall-mounted) perches, Cohen’s indoor cat play area also includes fun cat tunnels, skywalks and stairways. Check out the slideshow here of Cohen’s cat play areas. The inspiration for all of this? Bob Walker’s 1996 best-seller, The Cats’ House. 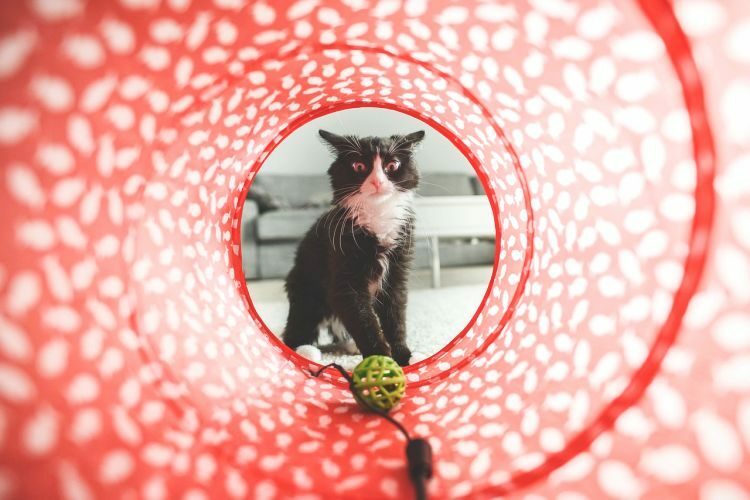 “You can, of course, simply designate a room or area to stock with your kitties’ favorite toys and essentials,” says Yahaira Cespedes, writing for PetMD. 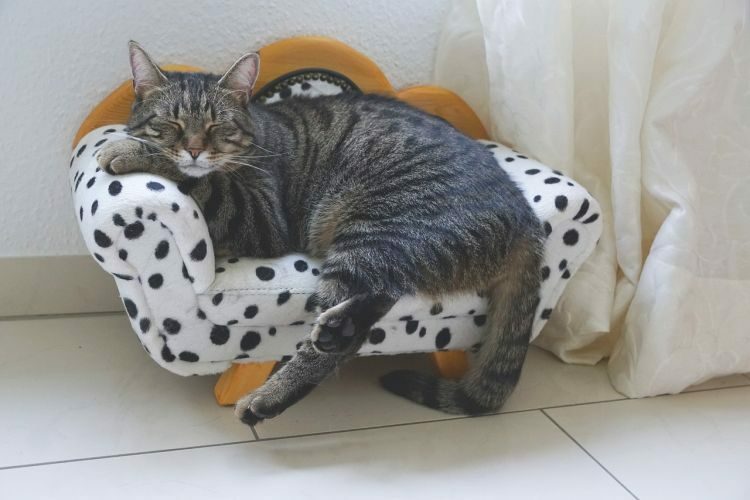 “That is why it is best to design a room where your felines can feel at home either at rest or at play,” she says. So look around your home. Is there a room or space that you don’t use much? Another friend has renovated her detached 1930s garage for a recent rescue. Arthur is pretty feral and far from ready to join her other cats. 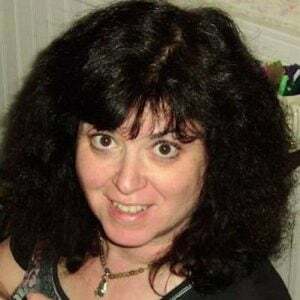 So Linda had a door and a couple of windows put in the garage, then added a rug, feeding station, toys, litter boxes, various cat tents/igloos, an old chair and a cot with an orthopedic pet mattress on it. There are even a couple of lighthouse lanterns on a timer and a wall clock that she thought would be “soothing” for Authur to listen to. 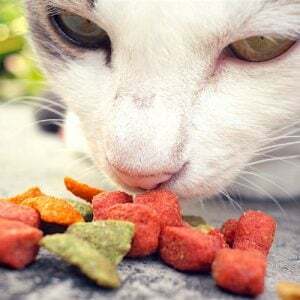 “Enriching a kitty’s surroundings usually involves doing less and more,” explains Dr. Karen Becker, DVM. 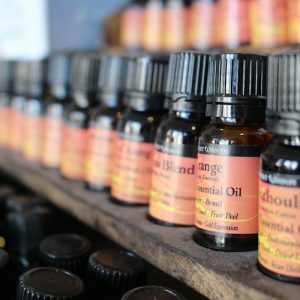 “Providing the proper environment increases the chances of living in harmony alongside these phenomenal creatures for years of enjoyment,” according to the AAFP. As it so happens, I recently gave my cats the finished part of the basement. They already had a few big cat trees and toys down there, so I just added a few more and some feeding stations. There’s even an exercise wheel and a secure window that they can sit in when the weather’s nice. My indoor cat play area still needs a little tweaking, but the cats are quite pleased with it. After all, there’s nothing like having a room of one’s own.